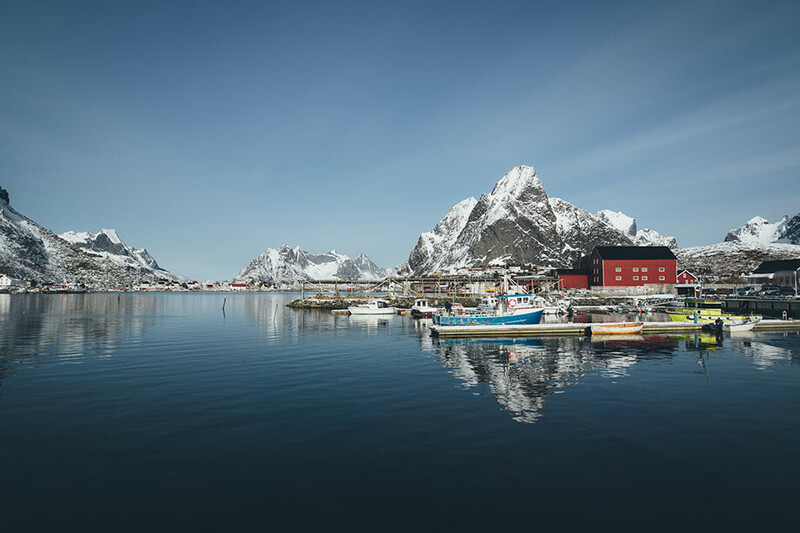 Dramatic mountains and peaks, open sea and sheltered bays, beaches and untouched lands – these words describes the Lofoten best! 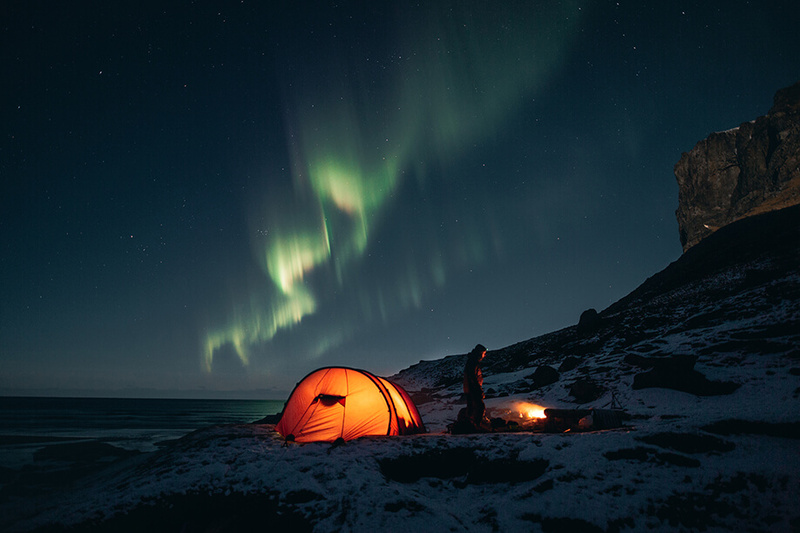 If you brave the Cold and go there during the winter months, your trip will be full unforgettable nights by the campfire and dancing Auroras. 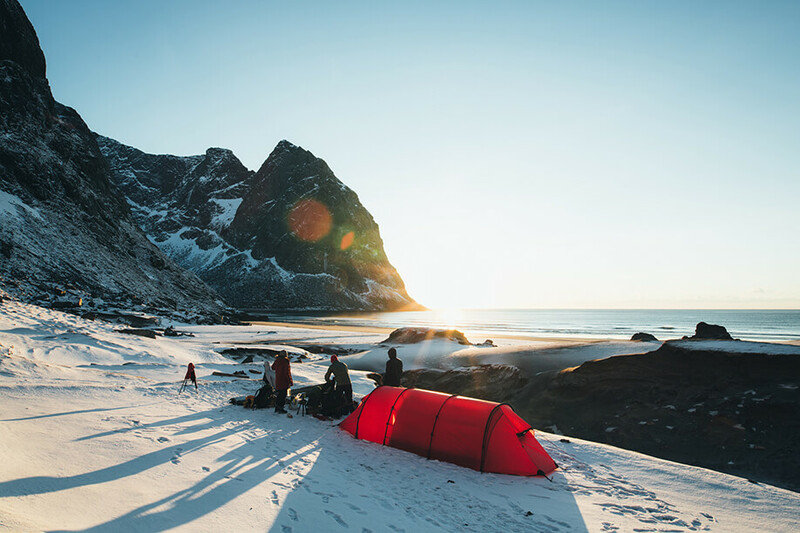 Here are some tips that make life easier up on the Arctic Circle! Definitely the best way to stay warm! 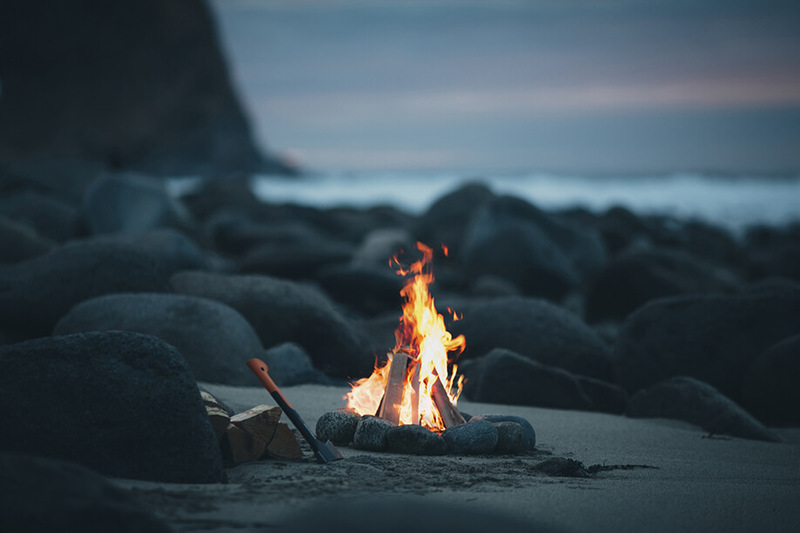 Making a fire after the sun went down is essential to brave the cold and stay outside instead of getting in the sleeping bag. Use the fire to cook some delicious food, boil water for tea or just to sit down together for having a talk next to it. Standing on the beach, seeing how the sky lightens up in green and blue shapes which dance along in an almost magical way is something truly special and kind of feels out of this world! 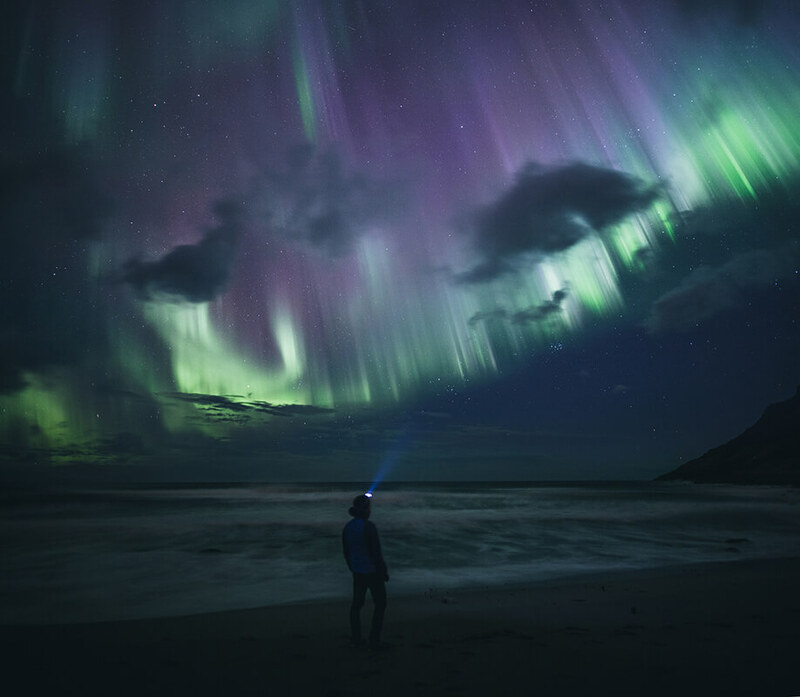 The Northern Lights is something that one has to see with their own eyes! For shooting this spectacle your tripod is along with a minimum f2.8 lens an essential key to good photos. Make sure not to expose for too long as the shapes will turn into an undefined color patch then. One of the most essential tools next to your camera and lens! The day is really short on the Arctic Circle during winter. Thus light is kind of week during the day too. If you seriously want to shoot landscape in the golden or blue hour or even during the polar nights you have to get a proper tripod that works for you. Get a stable one which can withstand the strong winds but on the other side get a light and compact one, so you’re still able to go hiking. The Island is full of hidden bays which are perfect for photography. Try to make your way to one of them – as most ways lead over passes that require a few hours of hiking, you will be probably alone on the beach. So get your camping gear, bring firewood and enjoy the loneliness in one of these remote areas. 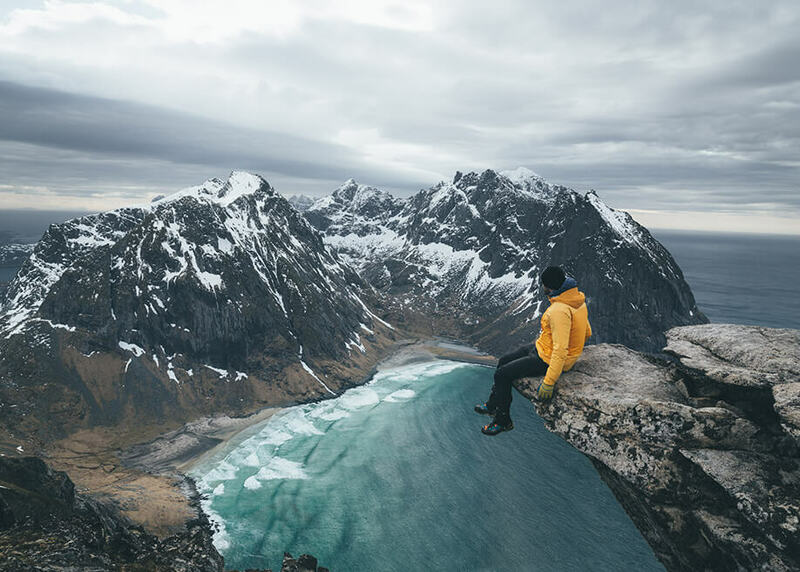 Lofoten is a paradise for anyone who is interested into climbing mountains. Pack your ice axe and crampons and go for a climb! Don’t forget to bring your photography gear as well – some of the best views are from up there! If you’re not much into climbing, you can go for a hike. 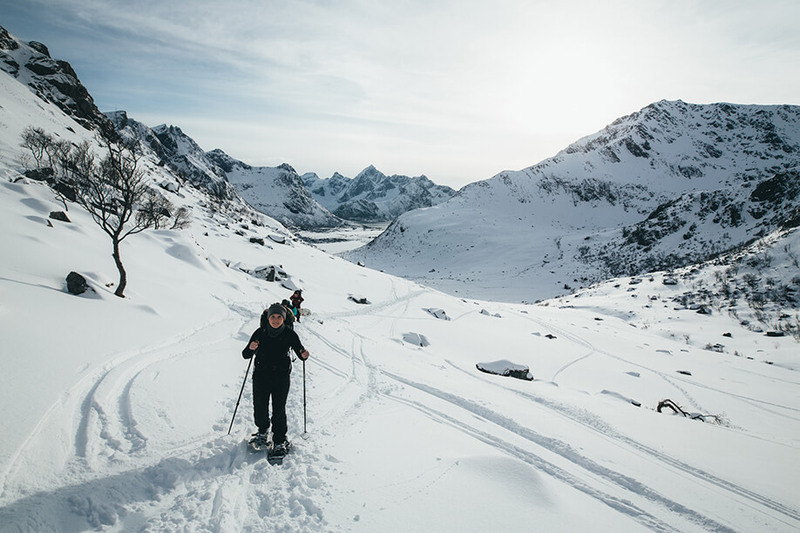 Depending on the snow conditions it’s required to wear snowshoes or tour skis to cross the snow safely. In reward of this you will have lots of fun and see the magical winter world of the Lofoten Island! Without doubt Lofoten Island is one the best spots to surf in Europe. 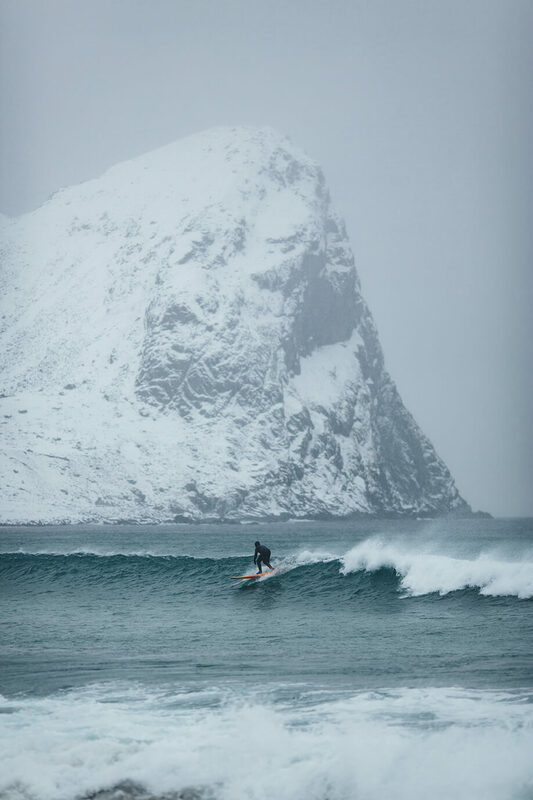 Some bays like Unstad gather loads of surfers – even during the winter months. With massive wetsuits they brave the Cold and the powerful waves. Try it by yourself or if you prefer the warmer option – get a hot chocolate and stay on the beach with a telephoto lens, trying to get some good shots of them! A monopod can be really handy in this situation when using focal lengths longer than 100mm, as you have to keep a relatively high shutter speed. Build right on the sea Reine is a charming town! Stroll through the small village and enjoy the views of the typically Norwegian red houses with an incredible backdrop. 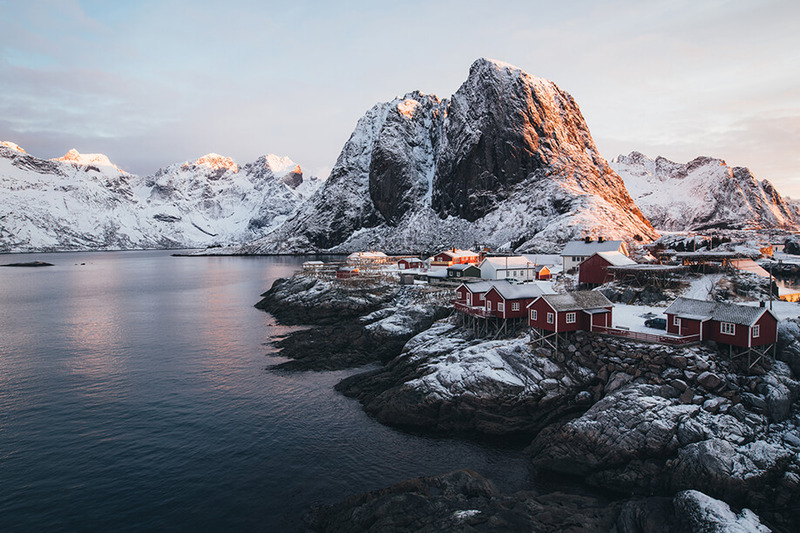 Hamnoy is one of the most popular photo stops on the Lofoten. To avoid the crowds go there during sunrise when the sun begins hitting the mountains behind the small village! Make sure to take your tripod and be aware of taking a bigger one, as it needs to higher than the bridges ceiling. A trip to Lofoten is only complete when staying in one of the huts! The charming fishermen interior makes it perfect for some indoor shots!